2018 SEMA is upon us! In less than 30 days we’ll be out in Las Vegas with most of the aftermarket scene. We have some exciting new products coming in 2019 that can be previewed November 1st and 2nd at Encore. 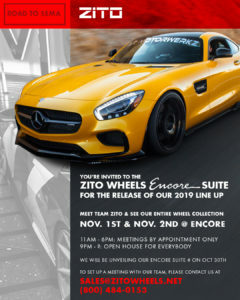 To RSVP please email sales@zitowheels.net to make an appointment for a meeting or to let us know you can make the evening festivities.